In recognition of the fact that an Article V Convention Of States is not a solution, but rather a Trojan Horse, both Maryland and Nevada rescinded all previous calls for a Con Con during the first week of April, 2017. Many well-intentioned conservatives cling to a Convention of States referred to in Article V of our Constitution as a solution to problems our country faces. However, numerous extremely radical, progressive and socialist organizations are also fighting for an Article V Convention with George Soros’ money and massive media outreach. Constitutional scholars* (see below) and political experience confirm that a Constitutional Convention once convened would be a law unto itself. Therefore, it could well put at risk some of our most cherished freedoms and even our entire Constitution. • COS advocates cover the full spectrum of ideologies and include hundreds of organizations in the Move to Amend coalition like Peace groups (Watch out Second Amendment. ), communist fronts, Sierra Club, Code Pink, Occupy groups, and Wolf-PAC, which wants to publicly finance elections. Some toy with ideas like direct democracy and the popular vote, while others never publicly state what they would seek from a convention. All that these groups have been able to agree upon so far is the desire to hold a COS.
• A COS cannot be limited, since there is nothing in the U.S. Constitution and no law to restrict its purpose, procedures, agenda, duration or election of delegates. • There is no way to assure that COS delegates would obey any restrictions placed on them by the states. They may not have to run for re-election and thus would be free from accountability to the public. • Term limits in states such as Missouri have given unelected bureaucrats the upper hand with procedural and institutional knowledge. In Alabama, state employees lobbying the Alabama legislature already seem disproportionate to the private sector. How much worse will it be to give the lifetime bureaucrats in DC even more power and control over a frequently changing Congress? • There is no stopgap for preventing ill-conceived constitutional changes from being ratified by 38 or more states. Modern communications capability gives moneyed special interests the ability to whip the populace up with emotional rhetoric to get them to vote for ideas that test well in focus groups rather than those that have survived the test of time. • We have for so long neglected to truly educate our children on the Foundational events and documents that created the United States of America that many now believe the Constitution and Bill of Rights, rather than being documents based on the careful study of thousands of years of human behavior, are outdated and irrelevant. It would be easy to stir up those so uneducated into a popular frenzy of support for any number of amendments that would fundamentally change our country. Let’s limit terms as needed at the ballot box and strive harder to observe the Constitution that we have. PLEASE OPPOSE SJR87. “…there is no effective way to limit or muzzle the actions of a Constitutional Convention. The Convention could make its own rules and set its own agenda. Congress might try to limit the Convention to one amendment or one issue, but there is no way to assure that the Convention would obey. After a Convention is convened, it will be too late to stop the Convention if we don’t like its agenda. The meeting in 1787 ignored the limit placed by the Confederation Congress ‘for the sole and express purpose’.” Chief Justice Warren Burger in letter to Phyllis Schlafly. Celebrate Church Child Care Week and stand up for our children and religious liberty – this week at the Alabama State House in Montgomery – Tuesday thru Thursday, April 11-13 beginning with a briefing at 10AM each morning in Room 325. We must stop HB277. HB277 is an unnecessary and unConstitutional overreach of government into church ministry. It is a violation of the Alabama Religious Freedom Act and the Free Exercise Clause of the US Constitution. It adds nothing to the health and safety of children already in day care run by legitimate churches. 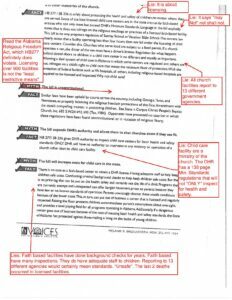 The language in the bill could open control by the DHR of other church related ministries. We cannot over emphasize the importance of the presence of you and your family and friends at the State House this week at least one of the days mentioned; and if you can attend more days, great. We must show our legislators that we are against HB277. Please give us an estimate of how many you estimate will be in your group. We will have people at the State House to help direct everyone and will have handouts in Room 325 to give to the House members along with a brief orientation. 1-334-242-7800 and the receptionist will connect you to your senator. If he/she is not available ask the secretary to give them a message that you will be traveling to Montgomery to see them for 5 minutes to discuss your opposition to HB277. Bring as many as you can! Remember, there will be a brief orientation and training. Bring your business cards, daycare pamphlets, or church/ministry information to pass out. For Instructions for State House Lobbying, visit our website, here. No one is exempt from children safety laws or regulations. What is currently required of license exempt (church) facilities? What are the thirteen agencies which regulate license-exempt providers in Alabama? Get the facts on HB277! It is important for Alabamians to learn more about the significant role of religious and private child care providers in Alabama. A large portion of Alabama’s families rely on these providers to care for their children on a daily basis. These are predominately church operated ministries to church members and outreaches to the community. A smaller number are affiliated with religious schools. Many prefer private facilities which are licensed exempt over state controlled facilities. In October 2016, there were 998 licensed and 943 license exempt child care centers in Alabama, according to Alabama DHR. The number of licensed exempt child care centers in Alabama is increasing because many families our choosing licensed exempt centers. Families already have a choice between licensed exempt and licensed by the state child care providers. Yet many decide to not attend licensed child care providers and purposely go to licensed exempt child care options. Even the grandchild of the sponsor of HB277 attends a license exempt child care provider in Alabama. Opposition to HB277 is about protecting children by protecting some of the best, safe, and positive child care options for children in Alabama. If hard working Alabamians no longer have high quality and low cost options, it harms children. Many families will no longer have the opportunities and options they rely on for their families. Licensed exempt day care providers are not exempt from child safety laws and regulations. All child care providers in Alabama are either licensed exempt or licensed. To become licensed exempt the provider must file appropriate paperwork with DHR including immunization records. In addition, the State of Alabama already places an affirmative duty on child care employees in private and public settings with the responsibility to report suspected child abuse. Child care providers are regulated for health and safety standards by multiple state agencies already. License exemption for child care providers in Alabama does not mean they are exempt from child safety laws and regulations. What is currently required of licensed exempt facilities? Notice to the department certifying health inspection reports, immunizations, and medical forms for all staff and children. Notice to parents of staff qualifications, pupil-student ratio, discipline policies, type of curriculum, religious teachings, and type of lunch program. What are the thirteen agencies who currently regulate license-exempt providers in Alabama? DHR and other state agencies have failed on many occasions to follow through on inspections to facilities. In 2014 changes to block grants from the Federal Government required DHR to inspect facilities receiving grants whether or not they are license exempt. Those inspections were not always completed. Regulations and license requirements have failed on many occasions to protect children. There is no evidence that licensed day care facilities are safer than license exempt facilities. We can all cherry pick examples in either public or private settings, but there is no factual evidence that licensed facilities are safer than non-licensed facilities. As a matter of fact, every claim of injury to children upon which HB277 proponents rely are as a result of the violation of health standards already required of licensed exempt facilities. If DHR and the responsible health departments had done their jobs, those events would not have happened. But more to the point, DHR regulation would not have prevented them. However, it certainly makes for good, if not misleading, selling points to uninformed observers. There is no guarantee that regulations or licenses will prevent all health incidents but one thing is clear: Alabama DHR had the ability to inspect Sunny Side Day Care facility prior to the staph incident. Licenses and regulations do not ensure a child’s safety. Do supporters of HB277 think that licenses and the regulations associated with this bill protect children? Why then are shopping center day cares exempt on page 6 of HB277 Why would public controlled facilities be exempt from this regulation? The potential for safety concerns for children is the same in these locations as others. The free market allows parents to decide for themselves in what type of educational environment or child care facility they would like to place their child. Most parents like options because it produces the best choices for their children. However some groups and individuals are resorting to scare tactics to push economic protectionism against religious affiliated facilities. In the last several years more families have been moving away from licensed facilities and towards licensed-exempt facilities. That concerns some who benefit economically from licensed centers. In addition to the economic protectionism aspects of HB277, the Federal involvement and out of state donations to lobbying organizations have thrown big money to groups and agencies to push for licensure mandates. As the fiscal note for the HB277 shows the financial support for this regulation comes from the Federal government http://alisondb.legislature.state.al.us/ALISON/SearchableInstruments/2017RS/FiscalNotes/FN-36426.htm. Another source of funding for this lobbying push comes from Kellogg Foundation a national out of state organization. Religious and secular child care providers both care about protecting children and helping families. That is why they do what they do. There have been many innuendos and false claims made about religious institutions in Alabama. The vast majority of Alabama’s religious institutions and religiously affiliated providers do wonderful work for Alabama’s families. Just as we do not judge every public school teacher by the actions of a small percentage of teachers we should apply that same respect for private and religious institutions. We punish the individual not an entire religious community or group. We do not judge every private child care institution by select bad actors. That promotes fear and prejudice between Alabama’s religious populations, the general public and state agencies. Solid public policy proposals will not result from fear tactics and prejudice. “A child care facility that is an integral part of a church or nonprofit religious school shall be licensed…” (pg. 27 of HB277) HB277 removes important religious liberty protections that ensure Alabama’s diverse religious population has freedom to exercise their religious beliefs in regards to early childhood development without government intrusion and control. 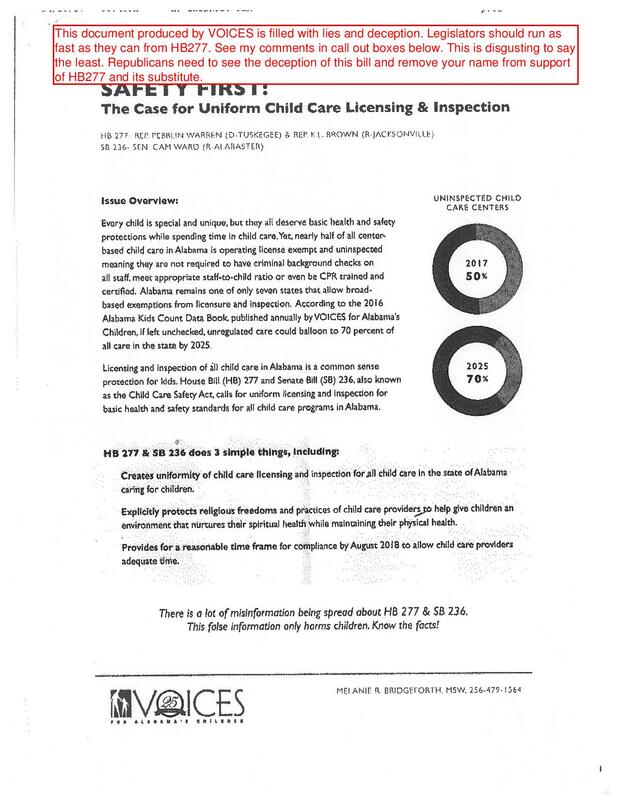 “Also under existing law, child care facilities that are part of a church or nonprofit religious school are exempt from licensing by the Department of Human Resources.” (pg. 1 of HB277) Alabama’s diverse religious communities have for generations worked to protect children, start hospitals, adoption agencies, founded schools, and ministries for the poor. Separation of church and state means that the state does not control the church or any religious institutions. If the church must receive a license from the state in order to operate a ministry that violates the religious liberty protections Alabamians have been provided in the state and Federal Constitution. Protecting children and religious freedom are not mutually exclusive. As a matter of fact parents and the Alabama Constitution expect them to be mutually inclusive. The Alabama Religious Freedom Amendment provides for what is called the “compelling interest test.” Government may not burden or restrict a religious activity or belief without first having a compelling interest to do so in the least burdensome or restrictive way. HB277 is unconstitutional and will likely face class action suit by Alabama religious institutions. It will very likely be struck down. (2) Is the least restrictive means of furthering that compelling government interest. Hundreds of licensed exempt facilities will close due to HB277 unnecessary regulatory overreach. HB277 oversteps and violates what the proper role of government is in Alabama. The government has an interest in protecting safety of all Alabamians but that does not mean the government should control private religious institutions. Reasonable regulations and criminal laws already punish bad actors. State agencies already retain the ability to regulate and inspect in needed situations. Demanding licenses and the regulatory power that comes with licenses will not improve children’s safety. Instead, a license requirement will mean more state control over private and religious institutions. If the church was must come to the state to request to operate then the church is not free from state intrusion. In addition to day cares HB277 will regulate mother’s day out, volunteers, day nurseries, and play groups. Currently there are more positive child care options and choices in early childhood service providers in the state of Alabama. Once HB277 passes that will no longer be the case. If you dislike one provider, you have options outside of state regulated facilities or facilities who accept grants. Families who rely on grants also have options currently. However, HB277 will remove this option for parents. It will require every child care provider to follow the same regimen, and it will give state agencies control of these institutions. Many private and religious child care providers in Alabama already go above and beyond minimum standards by DHR. HB277 would require every day care facility to follow the list of regulations called minimum standards. Child neglect, abuse, health, and safety regulations and law exist and are already in place outside of minimum standards. Many religious institutions or private facilities reject DHR minimum standards. These regulations have many aspects that are not directly related to child’s safety but they are instead more focused toward the facility. DHR would have the full authority to deny licensing, employment, and ability to volunteer based on individual receiving speeding tickets, or criminal charges even when found innocent. DHR would have the authority to consider a center’s beliefs unsuitable for licensing, employment and the ability to volunteer. 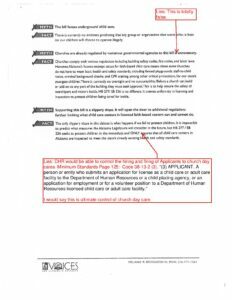 DHR can immediately terminate license, employment and the ability to volunteer for being viewed as unsuitable with no proof of wrongdoing. It gives them unintended control due to the subjectivity of determining who or what is “unsuitable”. DHR can close a center for what they “think” is a lack of business funds. DHR holds the approval to whether or not a Center Director can be hired. DHR requirements for certain number of staff per child. Rather than address the issue of a few “for profit” daycares masquerading as churches, proponents of HB277 want to remove the protection of all churches. The good faith offer of actual redress of the real problem has been disingenuously and deceitfully rejected by supporters of HB277 in favor of unconstitutional church regulation. Using child protection as an excuse, their real goal is church regulation of this very important church ministry, the choice of parents to raise up their children in the way they should go. 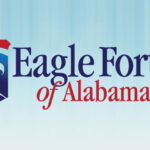 We need your help protecting Alabama’s families from government overreach today! Religious and private child care providers play an important role in Alabama. A large portion of Alabama’s families rely on these providers to care for their children on a daily basis. These are predominately church-operated ministries to church members and to the community. A smaller number are affiliated with religious schools. Many prefer private facilities which are licensed-exempt over state controlled facilities. In October 2016, there were 998 licensed and 943 license-exempt child care centers in Alabama, according to Alabama DHR. The number of licensed-exempt child care centers in Alabama is increasing because many families are choosing licensed-exempt centers. Families already have a choice between licensed-exempt and licensed by the state child care providers, but HB277 removes that choice. Even the grandchild of the sponsor of HB277 attends a license-exempt child care provider in Alabama. Opposition to HB277 is about protecting children by protecting some of the best, safe and positive child care options for children in Alabama. If hard working Alabamians no longer have high quality and low cost options, children are harmed. Many families will no longer have the opportunities and options they rely on for their families. There is a lot of misinformation on religious child care providers that has been pushed by out of state forces. Get the Facts here to address some of the false statements that have been pushed on the legislators. They need to hear from you about this church regulation bill. Call, e-mail and communicate on social media to your State Representative that you oppose HB277 now. The main number for the House of Representatives is 334-242-7600. Let them know that not only does it violates the Alabama Constitution, but it also harms Alabama’s children by removing positive options for them. There are a number of Republican legislators who currently support this legislation because they have not heard from their constituents, nor have they been provided with all of the facts about the bill. Many leaders throughout Alabama are stepping up to oppose this state overreach. You can help by contacting your pastor, community leaders in your area of the state or the administrator of your child’s private or religious school. Let them know you would like for them to support the Get the Facts statement on HB277. HB277 / SB256 Must be Stopped! 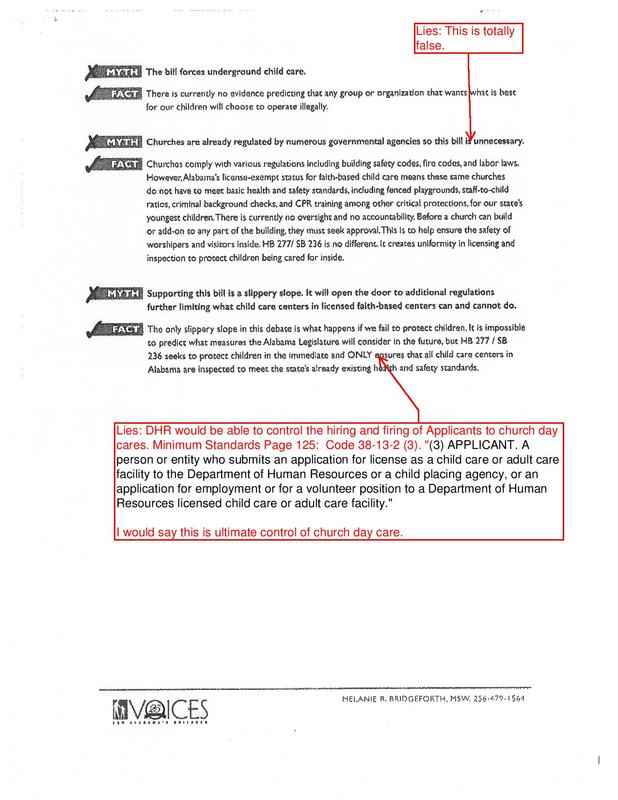 SB236/HB277 – Sponsored by Senator Cam Ward and Representative Pebblin Warren, proposes to require church nurseries and religious childcare providers (daycares) to be licensed by the state Department of Human Resources as are all other such providers. 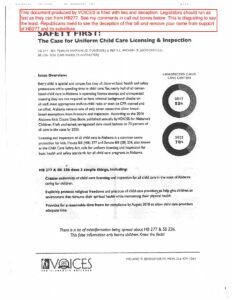 Church daycares and nurseries have always been exempt from licensure, even though their workers must pass background checks. The First Amendment should send a bold statement to state legislators about the proper role of state and federal government. Their role IS NOT to regulate churches or their ministries. This House bill passed unanimously by voice vote in the Child and Senior Advocacy Committee. 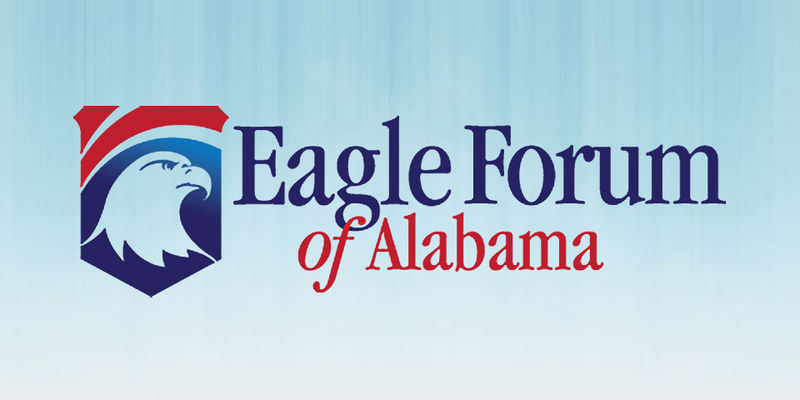 Eagle Forum of Alabama strongly opposes SB236/HB277. This bill will allow the state to regulate Vacation Bible School, for example. It removes important religious liberty protections that currently protect Alabamians. This bill is about much more than simply licensing church daycares and nurseries, it is also about money. Foundation grant money has been awarded here in Alabama to push for all Alabama daycares to be licensed. The Alabama DHR was awarded $1.7 million to improve the quality of daycare in the state. Their only answer to that is to license daycares in church which are now exempt, although such centers are statistically safer for children by far than licensed centers. Those involved in negotiating for changes to the bill have offered 5 changes that would deal with the issues brought up by proponents for all child care facilities but these were totally dismissed, giving credence to the fact that this is not about protecting children, but about money and control. Dollars are flowing from the federal government in support of licensed daycare facilities. The more that are licensed, the more money. With federal dollars come federal control. 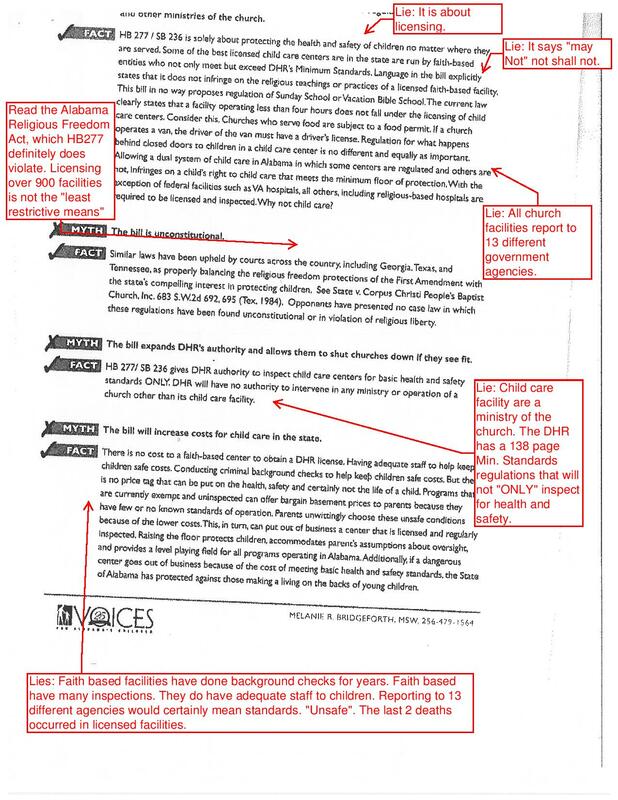 The bill says that in licensed church daycare facilities “no employee of the department (DHR) may infringe upon the ability of the center to teach or practice a religion.” However, these words would not control mandates from the federal government, such as those on the state Pre-K program that say, “no part of the day may be religious in nature.” If religious day care programs are required to be licensed, it is safe to assume that such mandates would follow.